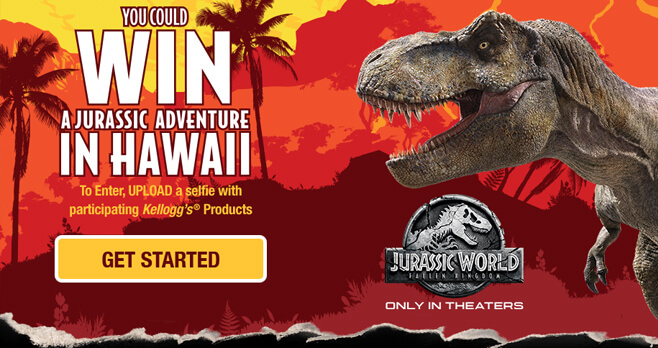 Enter the Kellogg’s Jurassic World Adventure Sweepstakes and you could win a Jurassic Adventure in Hawaii. For your chance to win, visit KelloggJurassicAdventure.com and upload a selfie with participating Kellogg’s products by July 31, 2018.
Who Can Enter? The Kellogg’s Jurassic World Adventure Sweepstakes is open to legal residents of the 50 United States and District of Columbia who are 18 years of age or older at the time of entry. When To Enter? Sweepstakes begins on 4/15/18 at 12:00:00 AM ET and ends on 7/31/18 at 11:59:59 PM (ET). What Is The Sweepstakes Prize? The Grand Prize consists of a trip for winner and one guest to the Kualoa Ranch in Hawaii. P.O. Box 7999, Kalamazoo, MI 49003-7999. Winner’s list to be available after 8/31/18.